"California" shown as an island on this 1650 map. 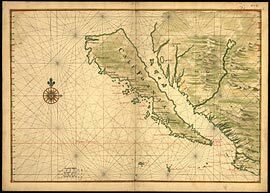 Long before Sir Francis Drake sailed into California waters, the Miwok Indians inhabited these lands. The Miwoks were the original stewards of the land surrounding Drakes Bay. For thousands of years, they lived here, using the abundant food sources provided by the land and the water of the Drakes Bay area. A century ago the Lunny Family took over stewardship of some of these fertile lands and waters. The Lunny’s have the same philosophy as the Miwoks when it comes to caring about the sustainability and conservation of this precious area. The Lunny family produces certified organic and certified grass-fed beef on the first certified organic pastures in Marin County. The herd began in the 1970's with all Hereford cows. Since then, no more cows have ever been purchased and moved onto this ranch. By managing this herd as a "closed" herd, the Lunnys have eliminated the potential of importing diseases with purchased cattle from out of the area. The herd today consists mostly of Hereford-Angus crossbred cows. The bay is named for Sir Francis Drake. It has long been considered the Drake's most likely landing spot on the west coast of North America during his circumnavigation of the world by sea in 1579. Drakes Estero has been in commercial oyster production for nearly 100 years. For most of its commercial history the estero was farmed by Johnsons’ Oyster Company. The Johnsons, over the past 60 years, developed much of the oyster growing techniques still used today. The Lunny family now owns and operates Drake’s Bay Oyster Company in the pristine waters of Drake’s Estero. The Lunnys have been farming and ranching adjacent to Drakes Estero for three generations. Drake’s Bay Oyster Company is the site of the last operating oyster cannery in the state of California. This historic facility is presently undergoing repairs to assure the continuance of the supply of the only shucked product produced in California.